The easy peasy slow cooker mashed potatoes we all know and love – but this time, they’re dairy-free! I’ve sung the praises of slow cookers for years now, and my fandom shows no sign of waning. 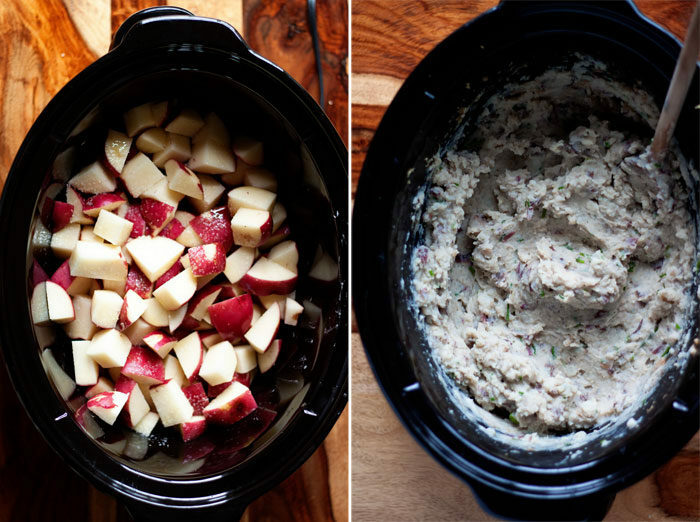 And among my favorite slow cooker recipes are mashed potatoes – like these and these. 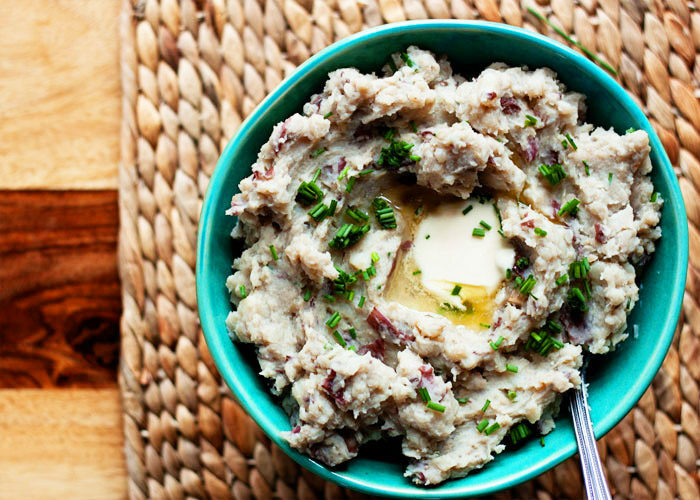 Slow cooker mashed potatoes are the easiest way to make mashed potatoes, pretty much ever. It was time, though, to create a version that was just as yummy and convenient, but dairy-free. 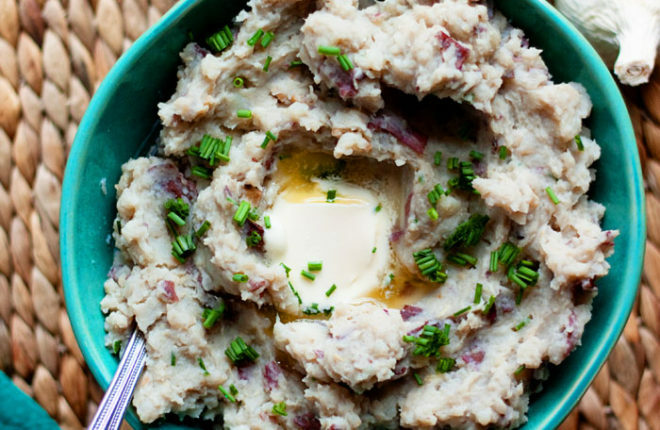 After all, holidays call for mashed potatoes. And Meatless Monday calls for mashed potatoes. 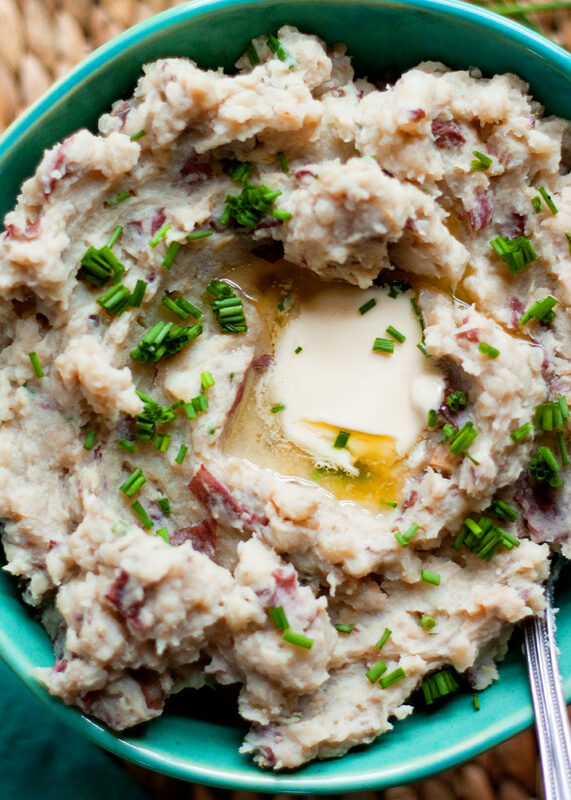 Heck, every day calls for mashed potatoes! Why not lighten them up a bit and make them accessible to everyone while you’re at it?! Creamy, dreamy almond milk to the rescue! 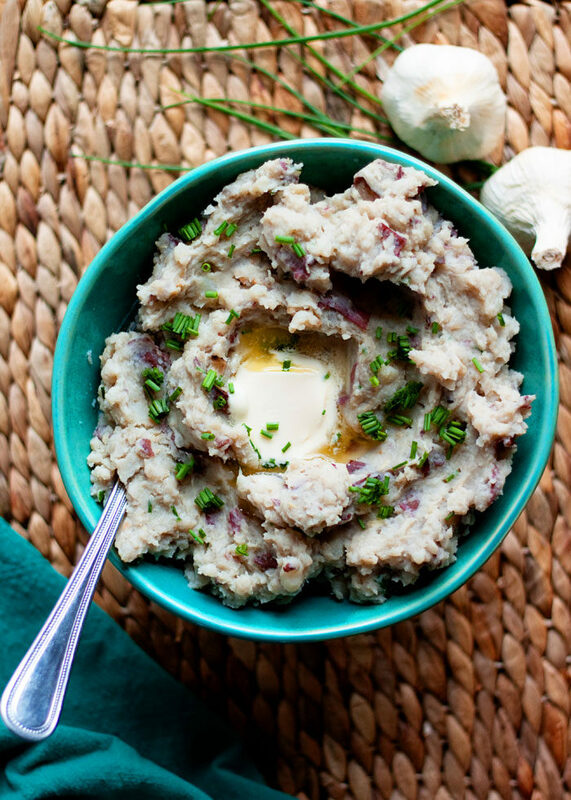 Yep, today I’ve teamed up with Silk® – another product I’m a huge fan of – to bring you these Vegan Slow Cooker Mashed Potatoes with Garlic & Chives. And they are SO GOOD. My goal was to create a mashed potato recipe that’s tasty for all – not just the vegans or dairy-free folks at the table. Thanks to Silk Almondmilk in place of the half-and-half or cream, we now have one mashed potato recipe for everyone! Of course, if you’re the vegan in the mix, you might just clutch the bowl to your chest and growl “mine!” whenever any grabby hands come close. Not that I would do that. Nuh-uh. Place garlic at the bottom of the slow cooker. Add potatoes. Drizzle with olive oil and sprinkle on the salt. Pout the vegetable broth over the top. Cook on high 3 – 4 hours or low 8 hours, until the potatoes and garlic are tender. Mash the potatoes! You can either use a potato masher or a hand mixer. I don’t recommend a food processor or stand mixer because they can overmix the potatoes and give them a starchy consistency. Mash the potatoes a bit, then pour in 1/3 cup of the almond milk. Continue mashing/mixing, adding additional almond milk until the potatoes are your desired consistency. Mix in the chives. Taste and add additional salt and some pepper, if desired, to taste. Scoop into a bowl and top with more fresh snipped chives and a pat of vegan buttery spread, if desired. Slow cookers can vary, so you may want to make sure you’re home the first time you make these. Once the potatoes and garlic are fork-tender, you’ll want to mash them. Overcooking can affect the consistency. *If you prefer smoother mashed potatoes, you can peel your potatoes. I like the bits of red potato skin in mine, so I leave the skin on. 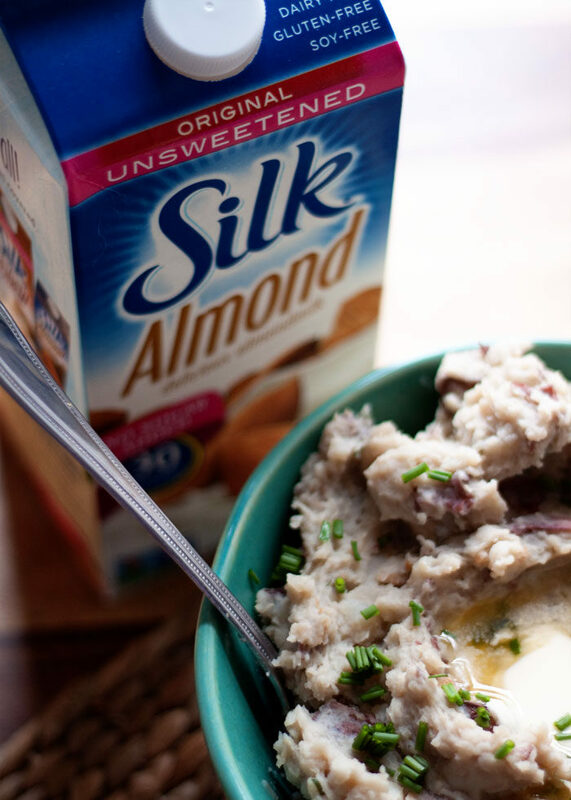 Silk Unsweetened Soymilk can be used in place of the almond milk. 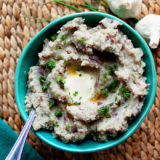 Adapted from my Unbelievably Easy Crock Pot Garlic Mashed Potatoes recipe.